Religion plays a “very important” role in the lives of most Americans; a proportion unique among developed nations. The most prevalent religion in the U.S. is Christianity. Northern European peoples introduced Protestantism, while the Spanish, French, and English introduced Catholicism. The Jewish community in the United States is composed predominantly of Ashkenazi Jews who emigrated from Central and Eastern Europe, as well as their U.S.-born descendants. American Islam effectively began with the arrival of African slaves. Research indicates that Muslims in the U.S. are generally more assimilated and prosperous than Muslims in Europe. Buddhism entered the U.S. during the 19th century with the arrival of the first immigrants from Eastern Asia. Sikhs have been a part of the American populace for more than 130 years. The first time Hinduism entered the U.S. is not clearly identifiable. American Islam: From the 1880s to 1914, several thousand Muslims immigrated to the United States from the Ottoman Empire and from parts of South Asia; they did not form distinctive settlements, and probably mostly assimilated into the wider society. Judaism: A world religion tracing its origin to the Hebrew people of the ancient Middle-East, as documented in religious writings known as the Torah or Old Testament. Religion plays a “very important” role in the lives of most Americans, a proportion unique among developed nations. Many faiths have flourished in the United States, including later imports spanning the country’s multicultural immigrant heritage and those founded within the country, These disparate faiths have led the U.S. to become one of the most religiously diverse countries in the world. The largest religion in the U.S. is Christianity, practiced by the majority of the population. From those queried, roughly 51.3% of Americans are Protestants, 25% are Catholics, 1.7% are Mormons, and 1.7% are of various other Christian denominations. Northern European peoples introduced Protestantism. Among Protestants, Anglicans, Baptists, Puritans, Presbyterians, Lutherans, Quaker, and Moravians were the first to settle to the U.S. The Spanish, French and English introduced Catholicism. The religion came with the arrival of Hispanics/Latinos, Irish, Highland Scots, Italians, Dutch, Flemish, Polish, French, Hungarians, German, and Lebanese immigrants. American Jews are citizens of the Jewish faith or ethnicity. The Jewish community in the U.S. is composed predominantly of Ashkenazi Jews who emigrated from Central and Eastern Europe, as well as their U.S.-born descendants. Depending on religious definitions and varying population data, the U.S. is home to the largest or second largest Jewish community in the world, after Israel. In 2007, the population of American adherents of Judaism was estimated to be approximately 5,128,000, or 1.7% of the total population. 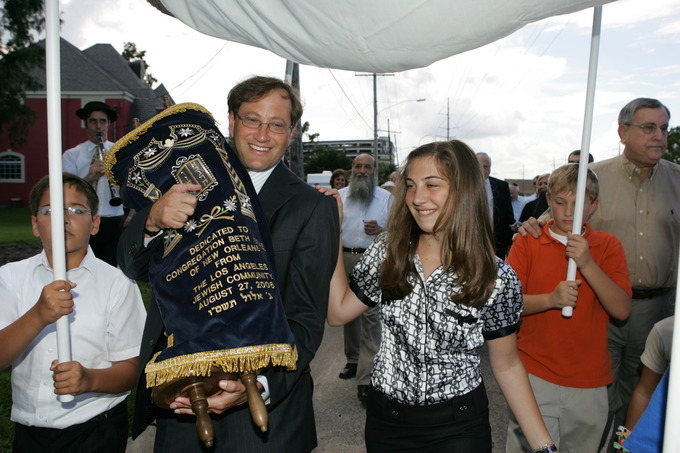 Hayley Fields at the Beth Israel Torah Dedication Ceremony: Two weeks after Hurricane Katrina struck the Gulf Coast, volunteers with an Israeli charity rescued seven Torah scrolls from the synagogue. American Islam effectively began with the arrival of African slaves. It is estimated that about 10% of African slaves transported to the U.S. were Muslim. Research indicates that Muslims in the U.S. are generally more assimilated and prosperous than Muslims in Europe. Like other subcultural and religious communities, the Islamic community has generated its own political organizations and charity organizations. Buddhism entered the U.S. during the 19thcentury with the arrival of the first immigrants from Eastern Asia. The first Buddhist temple was established in San Francisco in 1853 by Chinese Americans. The first time Hinduism entered the U.S. is not clearly identifiable. During the 1960s and 1970s, Hinduism exercised a fascination that contributed to the development of New Age thought. Sikhs have been a part of the American populace for more than 130 years. Around 1900, the state of Punjab of British India was hit hard by British practices of mercantilism. Many Sikhs emigrated to the United States, and began working on farms in California. 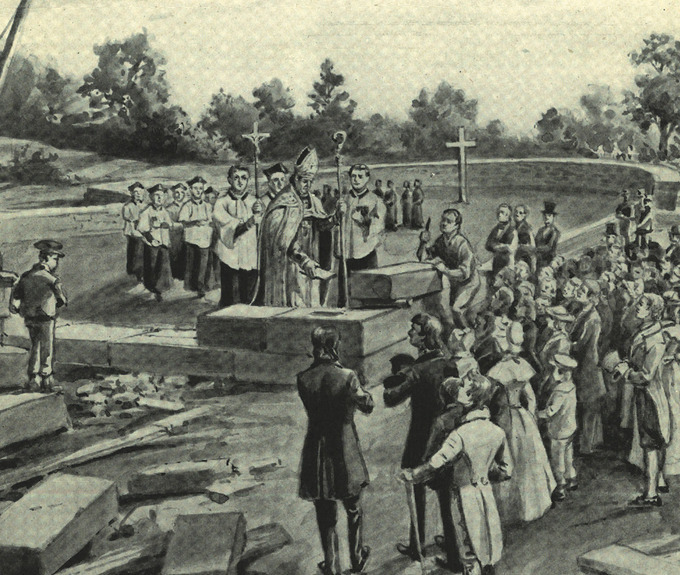 Baltimore Cornerstone: John Carroll, bishop of Baltimore, lays the cornerstone for the Cathedral of the Assumption in Baltimore, the first cathedral in the United States.